Nitrate is a natural substance that is produced upon the oxidation of organic compounds and is absorbed by plant roots. 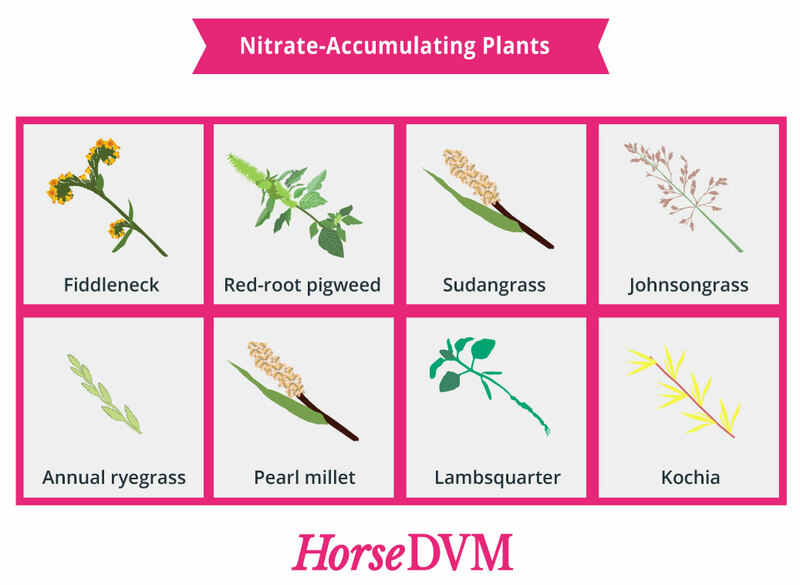 Most plants can only absorb small amounts of nitrates. However there are some plants which are able to accumulate large quantities of nitrates, which are referred to as nitrate-accumulating plants. Herbicides: When weeds are damaged but not killed by a herbicide it causes an increase in nitrate levels in the plant as a result of decreased enzyme activity associated with the smaller leaf area available. Fertilization: Fertilizing soils with nitrogen will result in an increase in soil nitrate levels in plants. Fertilization with high amounts of manure, especially late in the season, cause cause an increase in nitrate levels in plants. Diurnal Changes: Light intensity is inversely correlated to the nitrate content of plants. Diurnal changes in light intensity lead to a diurnal pattern of nitrate accumulation in plants. The nitrate content during the day is usually low, since it is when light intensity is at its highest. At night, when light intensity is at its lowest, is when nitrate accumulation is at its peak. Also, plants will accumulate more nitrates if they are in the shade or during cloudy, rainy days. Season: Nitrate accumulation varies with the season, with it being higher during the autumn-winter than in the spring. Plant Part: The nitrate content can differ depending on the plant part. Usually nitrate levels are highest in the lower one-third of the plant stalk and tends to be lowest in the leaves. Stage of Growth: Nitrate levels are usually highest in younger plants and decrease as the plant matures. Sudangrasses and sorghums however remain high even when plants are mature. Plant Species: Certain species of plants are able to accumulate higher amounts of nitrate then others, which are thus more toxic when combined with other factors causing elevated nitrate levels. Drought: Nitrate accumulates in plants during periods of moderate drought. When the drought is severe, the lack of moisture will actually prevent the plant from accumulating nitrates during the drought, however following the first rainfall plants rapidly accumulate high levels of nitrates, and remain high for 7 to 10 days. Temperatures: Temperature can affect nitrate levels in plants. When temperatures are less than 55 degrees Fahrenheit, which usually occurs in the spring or fall in most areas, plants can accumulate higher amounts of nitrates. Extreme hot temperatures can also cause an increase in nitrates in plants. The only method to determine if nitrates may be a problem is through testing. Nitrate poisoning can be rapidly fatal. When nitrate poisoning is suspected, a veterinarian should be called immediately to confirm the tentative diagnosis and to start treatment. If caught early enough to be able to administer treatment.